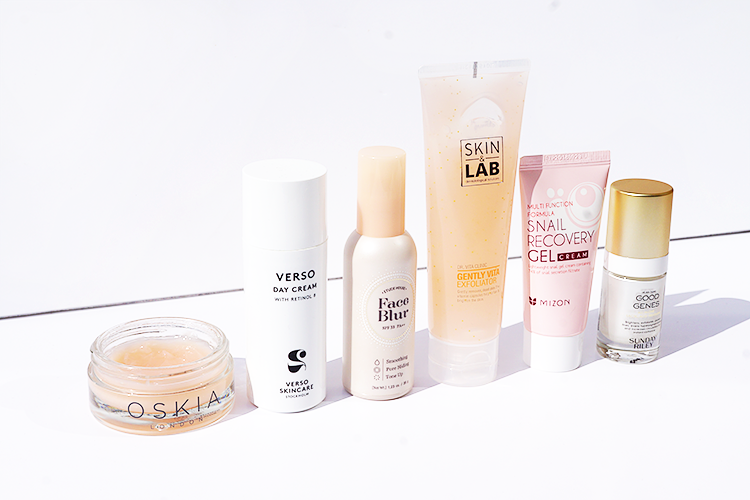 SPRING SKINCARE FOR DEWY, FRESH SKIN. 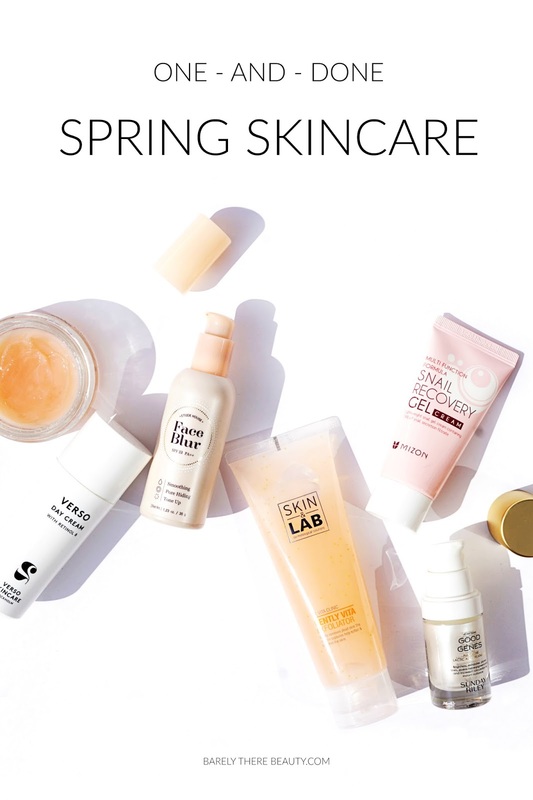 Spring is definitely a bit of a transitional time when it comes to skincare. As the weather gets warmer, my skin gets less dry, sun and humidity make me want less 'stuff' on my face, and I'm even more focused on achieving that dewy, fresh, radiant complexion. Here are a handful of my current favourites I reach for; the lightweight textures, and one-and-done, lazy-girl skincare products that are quick and easy to use but pack a punch when it comes to brightening and glowy skin. Verso Day Cream (and here for the US) £85 | A Swedish brand, Verso have taken it upon themselves to hone and perfect the benefits of retinols, one of the only skincare ingredients I really have any faith in when it comes to anti aging - their Retinol 8 is allegedly 8 times more effective than standard retinol?! Their day cream feels lovely and lightweight although it feels occlusive in some way, forming a light film over the skin that tightens and firms, but also reflects light slightly, in a happily brightening kind of way. Sometimes I just layer this with a cushion foundation (this is my current favourite) and I'm good to go - massively lazy but effective. Mizon Snail Recovery Gel (and here for the US) £9 | I like to wear a dedicated sunscreen, so layer another emollient moisturiser and things start to get a little to heavy for spring and summer. This gel, made up of 74% snail secretion filtrate a) doesn't smell in the slightest of snail, b) is fantastically lightweight and easily absorbed and c) still moisturises and nourishes really generously. And you even get peptides in this ridiculously affordable product, it's a no brainer for Spring. Sunday Riley Good Genes (here for the US) £85 | I love a good multitasker and this incredibly active elixir brightens, refines and smoothes with Lactic Acid to reduce acne scarring and the appearance of fine lines. So many promises are packed into this little bottle, it's a really excellent one-and-done skincare item for my more lazy days and it feels lovely and lightweight so definitely suitable for the warmer weather. Oskia Renaissance Mask £49.50 | This feels like my own little spa treatment at home. With passion fruit, AHA's and papaya enzymes, it gently exfoliates and brightens, leaving my skin feeling so soft and nourished, I really enjoy using it, it feels like such a self-indulgent treat. Etude House Face Blur £12 | This is such a favourite of mine, I could spend longer than I'm sure most would want to hear gushing about it. It's quite the multitasker, fulfilling all I want in a spring pep-er-up-per-er. Whilst I like to wear SPF 50 in general, the SPF 33 still ticks the sunscreen box, especially if you top it off with a cushion foundation. As a primer it firms and blurs pores and fine lines, and the subtle pale pink hue brightens your complexion, leaving you looking so healthy and radiant you could happily wear it alone for a no-makeup-makeup look. Do you change up your skincare routine come Spring? Let me know your lazy-girl skincare faves in the comments! 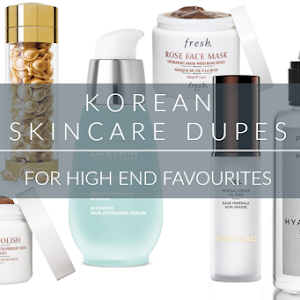 P.S Have you seen my guide to Korean Skincare? Refiners, essences, ampoules, serums - what do they all mean and how and when do I use them?! Oh I love this! Hearing all your favorite skincare products is such a treat. I've been wanting to try some snail products but honestly I can't get past the snail bit! If there is a way for me to get hypnotized or something I definitely would pay for it haha I just can't get past it for it some reason. I think it's because I just really hate bugs? I don't know! I just want to try the magical glory that is snail skincare but the psychology of getting myself to actually go through with it has been stopping me haha. Def wanna try Good Genes! I love reading what products other people use in their skincare routine as it always gives me some ideas of what to buy and I'm definitely going to add some of these to my to buy list for sure! I've been wanting to try the Cure gel for a while but the price puts me off so this would probably be a good alternative for me! The Etude House Face Blur is one of my top top products and I definitely need to do a repurchase, I can relate to how you want to gush about it! It's definitely one of the best bases I've come across and I love mixing it with my BB Cream as it just gives such a lovely finish and glow with such minimal effort! I also love how there's a little colour scheme here going with your skincare! It must look lovely all sat out together!